'Triplet' (Keith Keppel, R. 1987). Seedling #81-13B. IB, Height 23" (58 cm), Midseason bloom. Standards rose quartz (M&P 53-B-3), flushed nankeen (10-F-3); falls reed yellow (10-HI-1), rosy mauve (54-C-4) haft-sanding and paler edge; yellow-based beard tipped indian orange (1-D-12), firecracker (1-F-12) in throat; slight sweet fragrance. Seedling #71-111A. 'Gigolo' sibling X 'Nazette'. Keppel 1988. POD FERTILE. From AIS Bulletin #268 January 1988 Introducing TRIPLET (Keppel) M 23" (Logo sib). 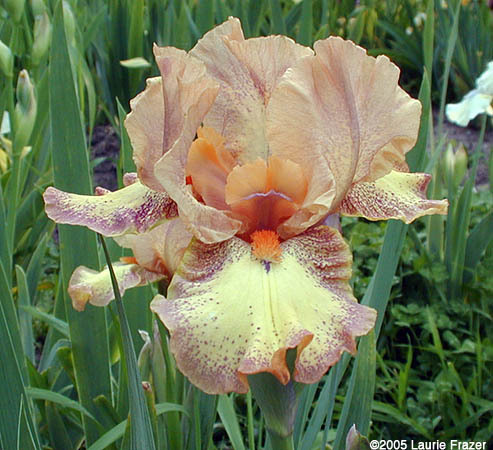 Apricot yellow to reed yellow with rosy mauve standard flush, hafts and paler edge; tangering orange beards. $15.00. Keith Keppel. JPG triplet01.JPG manage 71 K 28 Nov 2014 - 21:00 Main.TLaurin Photo by Don McQueen,London, Ont. Canada Zone5.